I was down for three days with some weird stomach bug, but I finally felt better this afternoon and ran out and caught on some errands. Found the laundramat downtown. It's a great one. Big. Clean. Brand new stainless steet front load washers and dryers. An attendant. Lots of sitting area. With nice chairs. And magazines. AND... that pinball machine. The Funhouse. It's in pretty bad shape. No bounce on the bumpers or the flippers. But it works well enough to be fun. 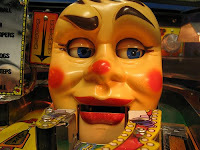 I'm embarassed to say I didn't even come close to rolling it over but I did impress the kids who were hanging on the machine watching, with my multiball concentration. But that wasn't the breakthrough. I think I finally cracked the dog. I was going out to the porch and he was standing there right at the stairs. We surprised each other but he didn't growl and I sat down right away. I talked sweet to him and he came over, sat down next to me and asked to be scritched. I think we're cool now.